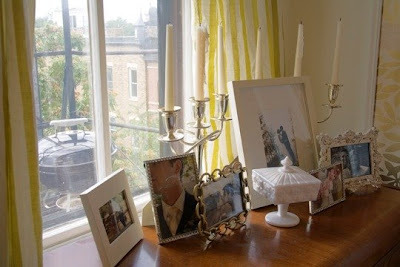 I love Apartment Therapy for all the house tours they do, from color house tours, small house tours and more. I was going through some old postings and I found Summer and Josh's Pumped Up Traditional, and fell in love!! As soon as I saw the first picture I had to save these in my LOVE files to keep for future use. Everything she did to that place I would want to do in my own; every piece of furniture, fabric, paint color was amazing! 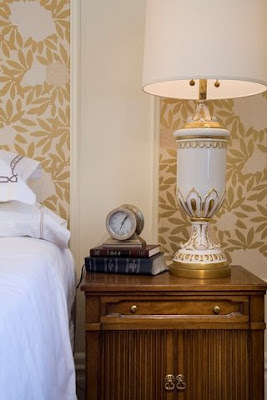 I love the term "pumped up traditional" and I'm going to start using it as I love a good mix of new and old. I love the panel of wallpaper over the couch! The fabric, colors, old meets new- I love it all! She switches out the cover on the coffee table and pillows with other fabrics for a different seasonal look- I LOVE that idea! That built in storage was made by her husband, it looks like its been there forever. I love that its is painted black too, the TV disappears in there and is not the focal point of the room. 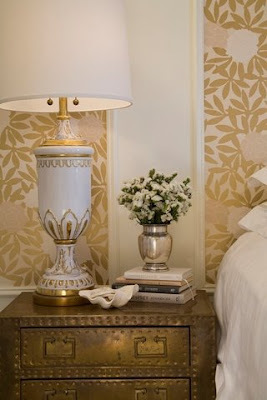 Those lamps are beautiful, they look like they could have been her Grandmothers (like mine!) but totally updated with the drum shades. Beautiful table scape- I love those candelabras. In fact, I think my parents have the same ones and next time I'm home I'm totally stealing them. 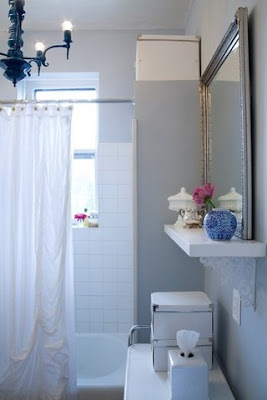 I love that switching out a light fixture in the bathroom to a chandelier makes it look so elegant. 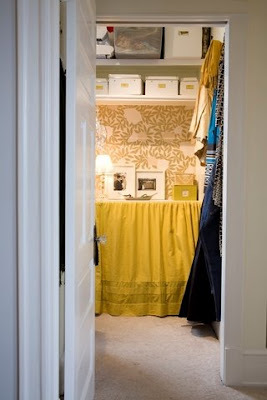 Same with the mirror, such easy changes but makes it look like a completely different room. 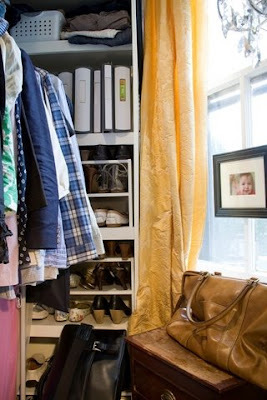 If I didn't have a medicine cabinet in my rental I would have done this too, maybe next apartment. 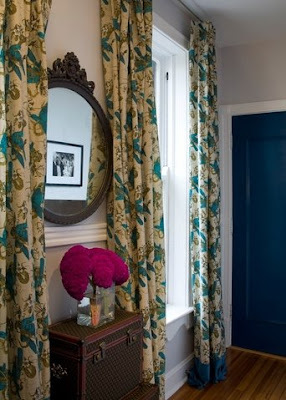 The colors in these curtains are beautiful. They look so expensive but can be done inexpensively at home with store bought panels "pumped up" with a beautiful silk trim at the bottom. 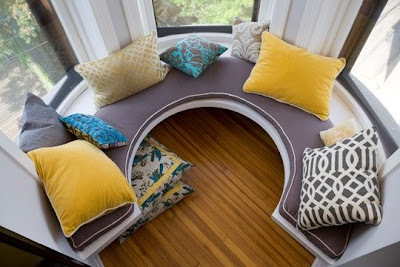 I wish you could see the bottom of the panels in my family room I would do this instead of the ribbon border. 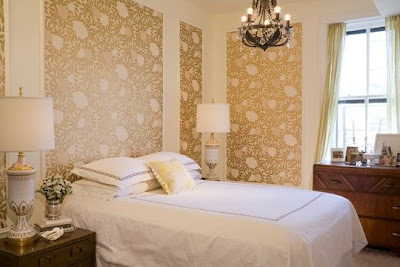 I just re-read the Apartment Therapy post again and Summer has her own design company, no wonder her place is amazing! yep, I am full on jealous right now. That place is amazing. Great ideas here. I am really enjoying your blog! WOw, I haven't seen this home on AT yet. Thanks for featuring it, I'm definitely going to check it out. 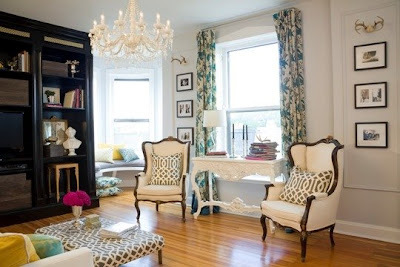 I Love the living room and her choices of furnishings and fabrics! This should SOOOO be in Domino mag!! !